Tomorrow night (at seven minutes past 10 to be precise) the sun reaches its northernmost position in its annual apparent journey around the sky, says Ian Griffin. In the southern hemisphere, this means we can all celebrate the winter solstice, the year's shortest day, with just eight hours and 40 minutes of daylight. While daylight may be in short supply, the nights are very long this time of year, which makes them a real drawcard for amateur and professional stargazers alike. I mention professional astronomers because, as anyone who has flown into Christchurch Airport over the past few weeks will have noticed, Sofia, the Stratospheric Observatory for Infrared Astronomy, Nasa's flying observatory, is visiting New Zealand. During the day, the observatory is parked on the tarmac and each night it takes off to explore the southern sky. Sofia is a technological marvel that has squeezed a powerful 2.5m telescope into the body of a 1970s-era Boeing 747. 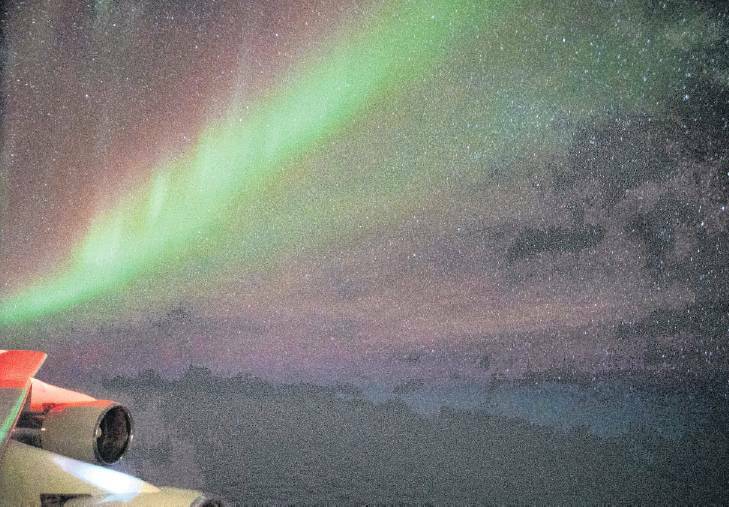 Flying high above most of the water vapour in Earth's atmosphere, Sofia studies the universe in infrared light. Since first taking to the sky in 2007, Sofia has flown nearly 500 times and made some key contributions to our understanding of the cosmos. Last Friday, I was invited to join Sofia on a mission heading thousands of kilometres south and west of New Zealand. The flightpath was driven by the needs of some German astronomers who are using a very special instrument called Great (German REceiver for Astronomy at Terahertz Frequencies) to make a detailed map of the central part of the Milky Way galaxy. Our flight took off just before 8pm, ascended rapidly to more than 40,000 feet and headed south. A few minutes after leaving Christchurch, a door in the rear of the aircraft opened to the sky, and Sofia's telescope pointed towards the night's first target. While astronomers used powerful scientific instruments aboard to study the centre of our galaxy last night, I found myself gazing in wonder through the windows at a gentle green auroral glow that kept us company during our southern sojourn. Astronomy is amazing!